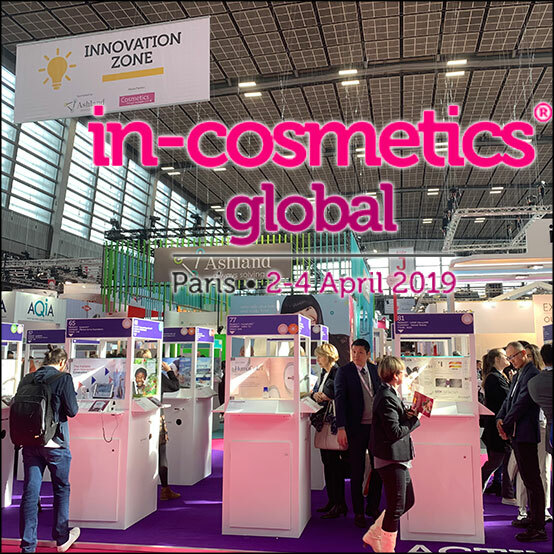 On April 2, in-cosmetics Global 2019 presented its awards for the best ingredients. Each year, they identify the most innovative active and functional ingredients launched over the past six months. They also saw green, sensory and make-up innovations highlighted. Presentation of the main ones, in texts and images! All the Innovation Zone award-winning ingredients can be found in pictures in the slideshow at the end of this article. Vita Rosalience brings to full bloom the latest discoveries on rejuvenating biological mechanisms and mitochondrial biogenesis. The innovative product is based on a patented plant embryogenic culture of Rosa rugosa. Extensive in-vitro studies have shown that Vita Rosalience positively regulates the synthesis of the youth protein GDF-11, resulting in the increase of mitochondrial biogenesis. Clinically tested, Vita Rosalience diminishes wrinkles appearance, promoting skin firmness and elasticity. Emulium® Illustro is a natural origin, PEG-free, water-in-oil emulsifier highly compatible with pigments and UV filters, but also with a wide range of cosmetic ingredients. It is self-sufficient thus does not need any co-emulsifier or stabilizer, and enhances stability in accelerated conditions and freeze/thaw tests.